A bad year will end on a stale note, and there’s not much reason to expect a rebound. Shares of Conagra Brands (NYSE:CAG) have collapsed in dramatic fashion as 2018 draws to a close. The stock is down 44% on the year -- with half of those losses occurring in December after the last earnings report -- retracing years of advance and currently sitting at its lowest valuation since 2012. Value investors may be interested after such a dramatic fall, but it still may not be the greatest food industry bet at this juncture. It's not as if Conagra's business has suddenly collapsed. 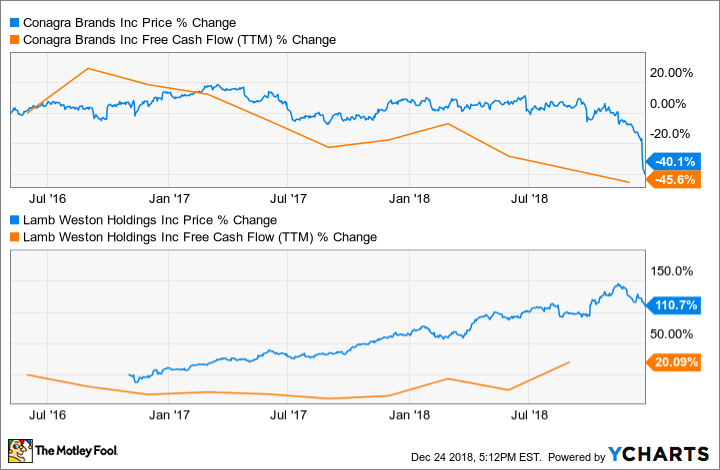 Through the first two quarters of the company's 2019 fiscal year (six months ended Nov. 25, 2018), sales growth is up -- although profits have been under pressure, especially after the acquisition of Pinnacle Foods was completed in October. P.p. = percentage point. YOY = year-over-year. Data source: Conagra Brands. Most of the sales growth can be attributed to acquisitions, though, like Angie's Artisan Treats and Sandwich Bros. Conagra's legacy business has been a mixed bag, with some quarters notching modest growth and others slight declines. In the meantime, the company's work to revitalize its core brands (like Marie Callender's, Slim Jim, and Reddi-wip) and interest payments from new debt to fund takeovers have left expenses high, reducing the bottom line. The current downtrend can be traced back to Conagra's planned separation from former subsidiary Lamb Weston (NYSE: LW) back in 2016. The all-things-potato Idaho-based Lamb Weston has continued to post modest but steady growth since then, while Conagra and its snacks and pre-packaged foods business has been in decline. Conagra management often talks about growth in its refrigerated and frozen portfolio, but that has not offset weakness elsewhere -- especially within Pinnacle, which includes names like Bird's Eye vegetables and Vlasic pickles. To put it simply, Conagra's focus on snacks and pre-packaged food has not worked out. Consumer tastes are changing, and innovation from upstart food companies is creating plenty of extra competition. Updating a legacy portfolio of brands costs money, as does acquiring smaller peers, an unenviable position the food industry has found itself in. That creates a favorable environment for the consumer, but not necessarily shareholders. Nevertheless, optimism that management could revitalize growth led to a big run-up in Conagra share price over the last few years, even as sales stagnated and free cash flow (money left over after basic operations and capital expenditures are paid for) declined. Realization has finally set in that Conagra is not a high-growth concern, and its trailing price-to-earnings ratio has fallen to a much more reasonable 11.5; that has driven the dividend yield up to 3.5%. Consumer staple stocks are supposed to be safe havens during stock market downturns, but that hasn't been the case this year. With expectations for shares getting reset, Conagra looks much more attractive than it did earlier in the year. Nevertheless, for investors looking for dividend payers in the food sector, General Mills (NYSE: GIS) has a PE ratio of 11.0 and a 5% yield; and The Kraft Heinz Company (NASDAQ: KHC) has a PE of 5.0 and dividend yield of 5.6%. I think those are much more compelling stocks at the moment as Conagra sorts through its acquisitions and tries to reduce expenses. Should You Buy ConAgra Brands After Its Post-Earnings Plunge?